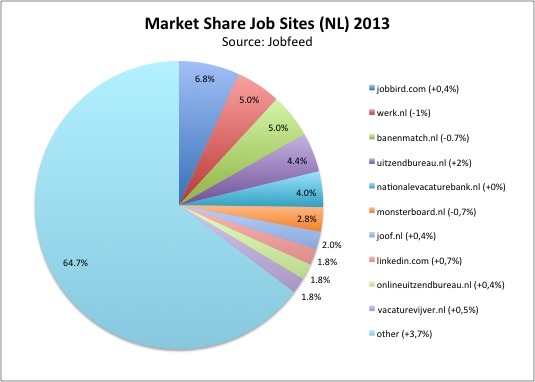 Jobfeed did an analysis on the largest job sites of 2013 and shows that Jobbird.com is the largest job site of the Netherlands. Jobfeed, the labour market analysis tool of Textkernel measured the number of job postings per site in 2013 and filtered out duplicates (the same jobs that have been posted on the same site within a time frame of 6 weeks). Jobbird.com is with an eleven percent growth compared to 2012 responsible for 6,8% of all job postings in 2013. On the second and third position, with a 5% market share each, are Werk.nl and Banenmatch. Both sites show a decrease of the number of jobs (14% and 9%), resulting in a 1% loss of market share compared to 2012. Market share of the largest job sites in the Netherlands in 2013, based on the number of posted job ads in 2013, excluding internships, student jobs, franchises and volunteering work and excluding internal duplicates (change of market share compared to 2012). Source: Jobfeed. The sites that show the largest increase in 2013 are Uitzendbureau.nl and LinkedIn, who rose 89% and 74% in volume of job ads. Jobselectie (-56%) and Dovajobs (-34%) show the biggest decreases. These sites belonged to the top 10 largest sites in 2012, but have dropped to the eleventh and thirteenth position in 2013. For more information on market shares of the job sites per quarter, read the (Dutch) Jobfeed analyses on Werf&. Jobfeed is the market analysis tool of Textkernel that collects all online jobs in the Netherlands and makes them analysable. Jobfeed can be used for collecting leads and background information (which organisation have open positions and where do they advertise their jobs? ), mobility (find that one perfect job for your client) and insight into the labour market (what is your position compared to your competitors? What is the situation in the labour market?). Would you like to know more about Jobfeed? Request a demo or register for the upcoming (Dutch) (free) webinar.